While the show has regressed with the passage of seasons, I still watch How I Met Your Mother every week and after reading Bence's Weekly WishList for June 21st, I decided to give this film a go. I must concede to Bence that I had low expectations for this film. Sure, sitcom actors turned screenwriter and/or director is a mixed bag. While Garden State was bad, there are films like Submarine that illustrate that it is possible to be a sitcom star and make great films. Unfortunately, HappyThankYouMorePlease and Josh Radnor do not fall within this category. 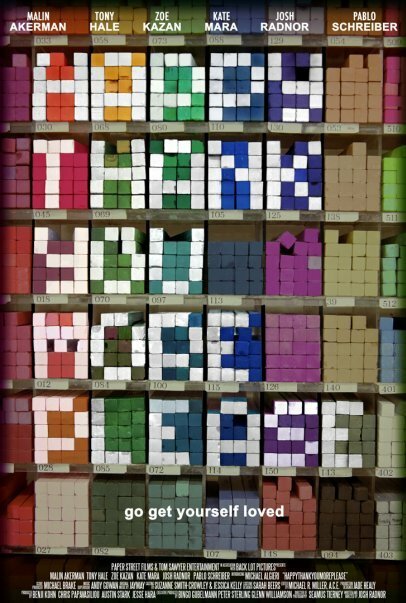 HappyThankYouMorePlease tells the tale of Sam Wexler (Josh Radnor), an aspiring author with no direction in his life. During a ride on the subway, he finds Rasheen (Michael Algieri) who has seemed to lost his foster Mom. Instead of leaving him with the police, he allows the boy to live with him because of his fascination with his artistic abilities. Throughout the course of this film, the viewer is exposed to Sam's friends: Annie (Malin Åkerman)(who has alopecia and desperately wants to be loved), Mississippi (Kate Mara) an aspiring singer, his fake cousin Mary Catherine (Zoe Kazan) and her boyfriend (Pablo Schreiber) as they meander through their existence in New York City. A publisher who pans Sam's book says that it is not good because the characters are simply unlikeable. This is apropos as none of this film's characters are likable. They exist as nothing more than pretentious indie film stereotypes. This film cuts between the stories of these characters and none of their stories are compelling. I could not wait until the credits rolled... I suppose I am a glutton for punishment. The script reads like it was put together according to the Zach Braff playbook for creating an indie film. The pretension worsens with the decision to feature a soundtrack with only original Jaymay tracks. I enjoy Jaymay's music (she had an amazing debut album) but her contribution of similar sounding songs were downright horrible. I really want to say something positive about the film but frankly, with the poor acting and the script that tries too desperately to be clever and witty, it is impossible. I thought of something positive! Kudos to Tony Hale, you had the only decent performance in this film. -Josh. Stick to reading other people's words. Also, Zoe Kazan and Paulo Schreiber, your family members (Elia Kazan and Liev Schreiber) are talented... I do not know if you are not or if your performances were the result of poor direction and screenwriting. You might be wondering why this film was added to Cavalcade and normally I would not waste my time reviewing it. But I figured since it was mentioned on June 21st, I would try and get the word out to avoid this film.